Heriberto Yépez recounts the experimental scene of Tijuana's border art laboratory (1992-2014). Fiamma Montezemolo, Traces, 2012, video. Courtesy of the artist. Starting in the 1990s, expressions like border art and arte fronterizo which, generally, referred to art from the northwest of Mexico and Southern California (particularly the Tijuana-San Diego conurbation), began to gain currency. Border art’s emergence was attributed to shared bi-national existence, immigration and to the political, economic, social and cultural circumstances surrounding the North American Free Trade Agreement (NAFTA); as well as to convulsive events such as the Zapatista uprising in Chiapas and the assassination of Mexican presidential candidate Luis Donaldo Colosio in Tijuana (what a turbulent year 1994 was! ); to the growth of drug trafficking and narcocultura—i.e., the culture surrounding that enterprise—as well as to the end of the PRI political party’s exclusive political/electoral predominance in Baja California. This agitated context was reflected in the arts. Art critics agreed something new was happening along the border and a group of artists received regional, national and international attention from academia, the media and the art world. From the time of its emergence, border art was understood as a series of expressions more representative of social processes than mere individual talents; expression that had more to do with collective conditions than personal worlds. During the two periods I studied intercultural conflicts on the Mexican side of the border, in Tijuana in 1985 and 1988, there were several times I thought that the city—alongside New York—is one of post-modernity’s greatest laboratories (p. 293)(1). From the time of its publication, García Canclini’s book left its mark on subsequent interpretations of Tijuana-based culture and “border art.” García Canclini considered the Mexico-US border a laboratory for globalization and, specifically, a laboratory of cultural hybridization. As such, the critic proposed considering the visual arts and Tijuana’s literary community at a time when these had not yet gained recognition; in fact, Culturas híbridas presaged the border art boom before its most emblematic artworks appeared. We prefer not to discuss these facts. We would rather talk about free trade, the war on drugs, immigration reform. We insist we are in control. We are wrong. Neither our current policies nor any proposed policies offer the slightest hope of improvement in a place like Juárez. Our economic beliefs have had a three-decades-long run in that city. They are no longer theories, they are realities. Thirty feet from the United States we can see the future… The city looks like a Marxist cartoon, though it is hard to say whether it is the work of Karl or Groucho… (p. 98)(2). 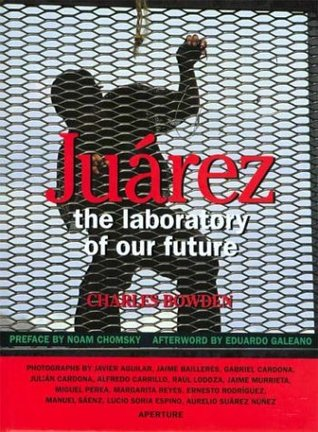 Charles Bowden, Juárez: The Laboratory of Our Future, 1998. These proposals are the poles from which the Mexico-US border was imagined in the 1990s and 2000s and, by extension, how its arts were interpreted. If for García Canclini, Tijuana was the felicitous laboratory of a global/hybrid present that let us read between the lines of new economies’ (liberal) promises and expectations, according to Bowden, the border was the neo-liberal laboratory that had already produced results, consequences and catastrophic ends. But there was something both interpretive poles shared. In García Canclini’s almost heaven-like vision as well as in Bowden’s apocalyptic outlook, the border was defined as a “laboratory”—the space-time where a series of experiments were taking place. But was the border a laboratory of hybridization, as Canclini affirmed? Or was some other kind of experimentation already germinating from that time? And let us not forget: García Canclini defined his theory of border art before that art had reached its “boiling point.” To a great degree, García Canclini’s hybridism was more a predictive than a descriptive notion—from which both its virtues and its errors derive. To take up border art’s historical processes I shall select four artistic laboratories characterized by different disciplines and moments from the last two decades. With these examples, we may be able to start re-thinking the laboratory in terms other than those of its representatives and leaders. Let’s consider an emblematic and highly influential artwork from border art’s first period, a performance tour by Coco Fusco and Guillermo Gómez Peña entitled Pareja en una jaula, from 1992. At the time, Gómez Peña was very active in the Tijuana-San Diego area and became the artist along that border with the greatest worldwide resonance. Pareja en una jaula involved the two artists being shut into a cage and costumed as indigenous people of a (nonexistent) tribe, as part of a colonialism-inspired tableau vivant. The artwork toured museums, galleries and art festival programs in Europe, the US, Latin America and Oceania. It was a black humor stunt that Fusco and Gómez Peña played on spectators whose reactions ranged from pity on behalf of the two “natives” on exhibit to outright racist aggression. The piece was an experiment designed to incite and document different audience reactions to a performative staging in which the two artists represented “Others,” i.e., non-Westerners, a “primitive” couple, two specimens from a non-modern world, the strange and “contemptible” beings from the far side of our habitual cultural borders. In subsequent years, Gómez Peña would be recognized as a major postmodern artist and for some time framed what it meant to be a “border artist.” Gómez Peña’s performance-based laboratory solidified as a radically experimental trajectory centered around the brusque metamorphoses that befell the subjectivities of its “beyond-border” beings. With that I’ll move on to another discipline and moment. Let’s consider the first three books by Tijuana author Rafa Saavedra—Esto no es una salida. Postcards de ocio y odio (1995); Buten Smileys (1997) and Lejos del Noise (2003)—all of which were written in a Spanglish mix designed to recreate in sound the environments and denizens of a nocturnal border town. 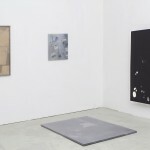 These works are notably experimental both in terms of form and content. Saavedra’s prose is quite atypical in comparison to other literary prose from the Mexico of that time. In some sense, Saavedra got a jump on the sort of writing –and media– (above all internet)-related experimentation that was to expand a decade later to a greater number of Mexican writers as well as to cybernauts in the global-Hispanic world. But for a full decade before that happened, Saavedra’s prose in Tijuana was considered the most experimental in literary terms. 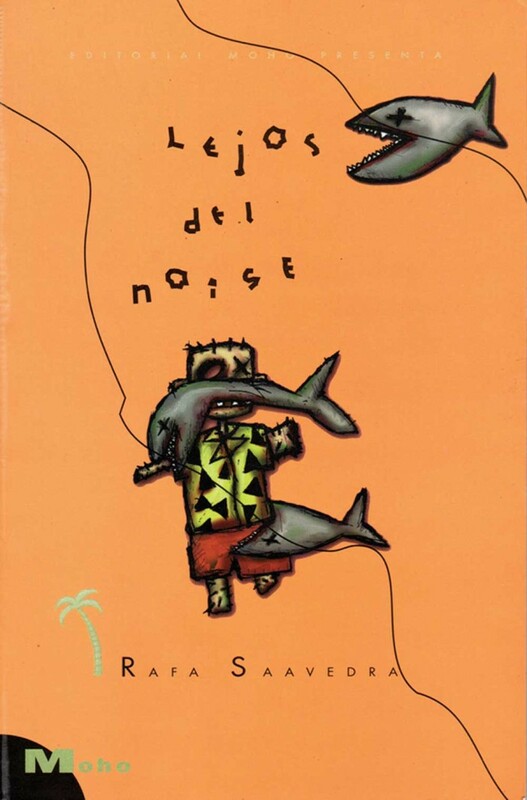 Rafa Saavedra, Lejos del Noise, 2003. Another much-remarked-upon aspect with regard to Saavedra was that his professional profile, i.e., his identity as an artistic producer, differed from other writers’ standard profiles. In addition to writing, Saavedra was a radio producer, a DJ, a fanzine editor, a computer sciences instructor, a cultural journalist, a photographer and a leading electronic networker. His border lab was a dual one: it narrated Tijuana in a sui genesis form of writing based on rhythm and remix as it created a new and heterogeneous artistic-professional profile. While other writers in (and out of) Mexico have imitated his literary style and techniques, Saavedra (who died in 2013) continues to serve as the edgy exemplar of the multidisciplinary subject-writer he proposed. Another, now-solidified moment of border experimentation is Nortec, an electronic music collective from the 2000s that merged (European) techno music with Mexican, norteña-style popular music. As a musical collective, it far surpassed mere local recognition. Not only—as critics tended to repeat—did Nortec quickly become a sort of soundtrack to border life, but as well, its members were identified throughout the decade as Latin America’s most influential electronic musicians. Nortec Experimental, album by Nortec Collective, 2001. Internet image. Courtesy of Heriberto Yépez. In 2014, fifteen years after putting together Nortec, its two principal members, Fussible (Pepe Mogt) and Bostich (Ramón Amezcua) announced the musical concept that had underlain their general aesthetic had exhausted its innovative possibilities and they declared that, as far as they were concerned, the Nortec laboratory had come to an end. They did not wish to repeat themselves. This was an unusual move in the Mexican and even international border-art realm. Generally, artists that acquire a style or recognition for an artistic concept continue to produce it (at the cost of self-imitation) or, in the best of cases, simply move on to a new phase or proposal. In their case, given the artistic concept was linked to a name, they proposed an original solution: to die as an identity or concept. Declaring the project-identity-name as finalized was part of an experiment to reach another, at-that-time unknown artistic proposal. Nortec Collective. Internet image. Courtesy of Heriberto Yépez. Finally, I’d like to take up the case of an Italian anthropologist named Fiamma Montezemolo. She established herself in Tijuana in 2002 to specifically study border art as part of her project as a researcher from El Colegio de la Frontera Norte (Colef) Cultural Studies Department. Her research project involved ethnography and an anthropological analysis of the movement surrounding border artists. That said, six years later Montezemolo announced her own transformation into an artistic producer, as an outcome of her research process and interactions with the Tijuana artistic community, as well as her abandonment of her role as a social scientist and observer, in order to participate as a border-based creator. Fiamma Montezemolo, Echo, 2014, video. Courtesy of the artist. Montezemolo’s work has expanded rapidly and centers on video and installation. Some of her artworks are thematically linked to the border and its laboratories. 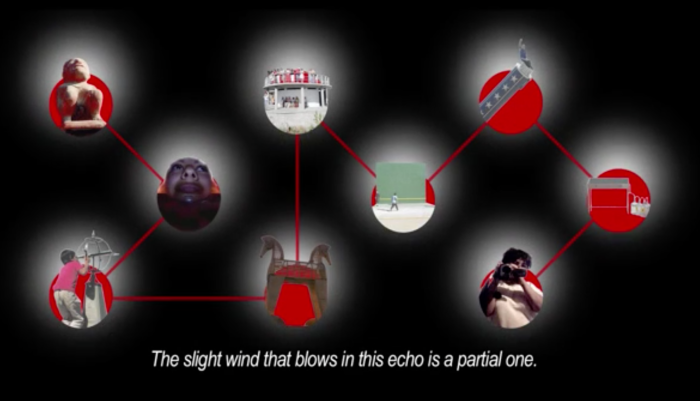 For example, Traces (2012) is a video that includes a sort of prose-poem where the artist speaks of the dividing wall between Tijuana and San Diego by trying to turn it into a powder-elixir to renovate her own life; in another video entitled Eco (2014), Montezemolo examines what happened with eight installation projects realized as part of the InSite art festivals (1994-2005) once they ended and their organizers and artists stopped directly keeping tabs on their site-specific pieces in Tijuana. Montezemolo’s work is part of a second moment in border aesthetics that emerged from that city, and hers is the most interesting work from that latter phase. Assuredly border art playfully evinced and explored changes to cultural identities during the first phases of globalization. Its artists explored the mix of signs, languages, codes, imaginaries and contexts that were then occurring between the global North and South, particularly the culture clash between the United States and Mexico in the age of NAFTA. An important part of the material with which their pieces worked were repertoires that emerged from relationships, flows, exchanges, clashes and asymmetries between societies on the North and South sides of the border. The first commentators (such as García Canclini) and, above all, the artists themselves clearly identified working with these materials as one of the intentions fueling their border poetics, as well as a creative reflection on (national and post-national) identity as one of its principal themes. If a first phase of border art has been defined as a material exploration of cross-border repertoires and a thematic concern with cultural identity, these artists’ laboratory, however, was not reduced to those elements. Its experimentation with identity included “altering oneself” or “becoming others” through new practices, disciplines, conditions or phases, or even by questioning or abandoning a professional identity to develop another. Up to the end of his productive career, Rafa Saavedra opened up his interdisciplinary range, rejecting a sole identity as a literary writer; major figures from Nortec pronounced the end of their project and a mutation of their identity, materials, name and overall concept; and, coming off of an institutional ethnographic project, Fiamma Montezemolo ended up becoming a new, trans-national, cross-border artist (now residing in the San Francisco Bay Area) by constructing an explosive conceptual-professional bridge between being an academic and being an artist, becoming the kind of creator that originally she only sought to analyze. These mutations, more than being a new collective trend among communities, were a component that was present from the beginning; and this has become an increasingly preponderant aesthetic element in recent phases. The creation of new subjectivities might well be the new center of border-related arts. This persistent mutation of productive identity is currently joined to a sensation that border art’s initial boom period has ended. The aesthetic based on mix and hybridization is no longer self-sustaining as a sufficient definition. Critics identified them with that aesthetic but border artists, from the start insisted that what they sought could not be reduced to hybridism. Faced with an exhaustion of that second-tier component, their search, obviously, has gone on; other elements, present since the early stage, and new elements that have been added over time as part of their explorations, now guide their proposals. As well, this collective sensation of exhaustion with regard to the hybrid aesthetic opens up a new set of possibilities no longer derived from the first materials, the hybridizing mix or the art object in general, but rather, centered on the subject and its identity mutations; specifically, changes to the neo-border artistic subject’s identity/profession, identity/discipline and identity/concept. Border art’s first critics identified it as centered on an exploration of cultural identity. But in their works and trajectories, in fact, border artists demonstrate that what is put into play is not so much “cultural” identity but more precisely work-related identity. This distinction, in turn, allows for another: border art is less an archive of aesthetic products born of mixing than a community of mutating producers. Border art has insisted on destabilizing the artist’s work-related identity and now experiments with its own (re)plasticity. The key word to border art is work. Border artists, given they have operated within a markedly local context—where the art market or even official art history (national or international) has not been determinant to the form their artworks have taken—contrived to have other forces configure them. 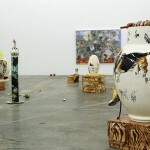 As has been stated, the nature of Tijuana’s economic dynamic shaped its artists, and in particular their ways of working—from maquiladora-style assembly, ubiquitous recycling and labor flows to informal and bi-national employment—seem to have become more determinant forces driving the formation of their artworks and subjectivity than galleries, Mexican tradition or art histories. To begin with, most of Tijuana’s border artists did not come out of art-related university training. From the beginning, becoming an artist in Tijuana meant radically transforming their professional/work-related identities. More than two decades out from Tijuana border art’s beginnings, we can define it as a laboratory for experimentation corresponding to a community that decided to build its own profile as art-subjects and that as a community continues to give rise to new mutations in subjectivity. When observed in retrospect, border art reveals that one of its key components has been experimentation that skews to new types of artistic producers. In the quarter century since its emergence, it’s also clear that this subjectivizing laboratory for experimentation continues to reinvent itself. (1) García Canclini, Nestor, Culturas híbridas. Estrategias para entrar y salir de la modernidad, 1990. Paidós Ibérica, Madrid. p. 293. (2) Bowden, Charles, Juárez, the Laboratory of Our Future, Aperture, Mexico, 1998. Fiamma Montezemolo, Traces, 2012, video. Cortesía de la artista. A partir de los años noventa circularon las expresiones “border art” y “arte fronterizo” que, generalmente, se referían al arte del noroeste de México y el sur de California (especialmente Tijuana-San Diego). Se atribuía la aparición del arte fronterizo a la convivencia binacional, la migración, las condiciones políticas, económicas, sociales y culturales del Tratado de Libre Comercio de América del Norte; a eventos convulsivos como el levantamiento zapatista en Chiapas y al magnicidio de Luis Donaldo Colosio en Tijuana (¡aquel turbulento 1994! ); al crecimiento del narcotráfico y la narcocultura en la región, así como al fin del dominio exclusivo del PRI a nivel político-electoral en Baja California. Ese contexto de agitación se reflejaba en las artes. La crítica coincidía en que algo nuevo ocurría en las artes de esta frontera y un grupo de artistas recibieron atención regional, nacional e internacional por parte de academia, medios y mundos del arte. Desde su surgimiento, el arte fronterizo fue entendido como una serie de expresiones representativas de procesos sociales más que de meros talentos individuales; de condiciones colectivas más que de mundos personales. Desde su aparición, el libro de García Canclini marcó a las siguientes interpretaciones sobre la cultura de Tijuana y el “arte fronterizo”. García Canclini consideraba a la frontera México-Estados Unidos como un laboratorio de la globalización y, en específico, un laboratorio de la hibridación cultural. En este sentido, García Canclini apostó por pensar al arte visual y la comunidad literaria de Tijuana en un momento en que todavía no eran reconocidas; de hecho, Culturas híbridas predijo el boom de las artes fronterizas antes de que aparecieran sus obras emblemáticas. Estas propuestas son los polos desde los que se imaginaba la frontera México-Estados Unidos durante los años 1990-2000’s y, por extensión, cómo fueron interpretadas sus artes. Si para García Canclini, Tijuana era el afortunado laboratorio de un presente glocal-híbrido que nos permitía entrever las promesas y expectativas (liberales) de las nuevas economías, de acuerdo a Bowden la frontera era el laboratorio neoliberal que ya había arrojado resultados, consecuencias y saldos catastróficos. Pero hay algo que estos dos polos interpretativos compartían. Tanto en la visión casi paradisíaca de García Canclini como en la apocalíptica de Bowden, la frontera era definida como un “laboratorio”: el espacio-tiempo donde una serie de experimentos sucedían. Pero, ¿era la frontera un laboratorio de hibridaciones como afirmaba Canclini? ¿O había otra experimentación germinándose ya desde entonces? No olvidemos: García Canclini definió su teoría sobre las artes fronterizas cuando no habían alcanzado su punto de ebullición. El hibridismo de García Canclini, en buena medida, fue una noción predictiva más que descriptiva. De ahí sus virtudes. Y sus errores. Para abarcar el proceso histórico del arte fronterizo elegiré cuatro laboratorios artísticos de distintas disciplinas y momentos de las últimas dos décadas. Con estos ejemplos quizá podamos comenzar a repensar este laboratorio en otros más de sus representantes y direcciones. Pensemos en una obra emblemática y muy influyente del primer periodo del arte fronterizo. Se trata de una gira de performance de Coco Fusco y Guillermo Gómez Peña titulada “Pareja en una Jaula” de 1992. Durante ese periodo, Gómez Peña estaba muy activo en la región Tijuana-San Diego y se convirtió en el artista de esta frontera con mayor resonancia mundial. “Pareja en una Jaula” consistió en que ambos artistas permanecían encerrados dentro de una jaula y ataviados como indígenas de una tribu (inexistente) en tableau vivant colonial. 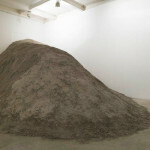 La obra operó como un tour en museos, galerías o programaciones de festivales de arte en Europa, Estados Unidos, Latinoamérica y Oceanía. Era una broma pesada que Fusco y Gómez Peña jugaban a los espectadores, cuyas reacciones iban desde la lástima por este par de “nativos” en exhibición hasta la agresión racista. Esta obra era un experimento para incitar y documentar las distintas reacciones de públicos hacia un montaje performático en donde los dos artistas representaban a los “otros”, los no-occidentales, una pareja primitiva, dos especímenes de un mundo no-moderno, los extraños y “despreciables” seres del otro lado de nuestras fronteras culturales habituales. En los siguientes años, Gómez Peña sería reconocido como uno de los principales artistas posmodernos y por algún tiempo marcó qué significaba ser un “artista fronterizo”. El laboratorio de Gómez Peña, basado en el performance, se consolidó como una trayectoria radicalmente experimental en torno a las rudas metamorfosis ocurridas en las subjetividades de sus seres “ultra-fronterizos”. Ahora pasaré a otra disciplina y momento. Pensemos en los tres primeros libros del autor tijuanense Rafa Saavedra: Esto no es una salida. Postcards de ocio y odio (1995); Buten Smileys (1997) y Lejos del Noise (2003) que fueron escritos en una mezcla de inglés y español para recrear sónicamente ambientes y seres de una city nocturna fronteriza. Son obras bastante experimentales tanto al nivel de la forma como del contenido. La prosa de Saavedra es muy atípica de otras prosas literarias de ese periodo en México. De alguna manera, Saavedra se adelantó al tipo de experimentaciones de la escritura y los medios (sobre todo, Internet) que iba a extenderse una década después a más escritores de México y cibernautas del ámbito hispánico-global. Pero antes de que eso ocurriera, durante toda una década la prosa de Saavedra era considerada en Tijuana como la más literariamente experimental. Otro aspecto notorio en Saavedra era que su perfil profesional, su identidad como productor artístico, difería del perfil estándar de otros escritores. Además de escribir, Saavedra era productor de radio, DJ, editor de fanzines, profesor de informática, periodista cultural, fotógrafo y animador de redes electrónicas. El laboratorio fronterizo de Saavedra fue doble: narrar a Tijuana con una forma de escritura propia basada en el ritmo y la remezcla y crear un perfil artístico-profesional heterogéneo y nuevo. Si bien ya otros escritores en México (y fuera) imitan su estilo y técnicas de escritura, Saavedra (que murió en el 2013) sigue siendo vanguardia del tipo de sujeto-escritor multidisciplinario que propuso. Otro momento ya consolidado de exprimentación fronteriza es Nortec, un colectivo de música electrónica de los 2000’s que fusionó música techno (europea) con música popular norteña (mexicana). Como colectivo musical superaron por mucho el reconocimiento local. No solamente (como solía repetir la crítica) Nortec rápidamente se convirtió en una especie de soundtrack de la vida fronteriza sino que, además, fueron identificados durante toda esa década como los músicos electrónicos más influyentes de Latinoamérica. Nortec Experimental, álbum de Nortec Collective, 2001. Imagen de Internet. Cortesía de Heriberto Yépez. Tres lustros después de inventar Nortec, en 2014 los dos principales integrantes de Nortec, Fussible (Pepe Mogt) y Bostich (Ramón Amezcua) anunciaron que el concepto musical que había fundamentado su estética en general había agotado sus posibilidades novedosas y que, por su parte, declaraban finalizado el laboratorio de Nortec. No querían repetirse. Esta fue una medida inusitada en el campo artístico fronterizo, nacional e incluso internacional. Por lo regular los artistas que adquieren un estilo o reconocimiento por un concepto artístico permanecen produciéndolo (al precio de auto-imitarse) o, en el mejor de los casos, simplemente cambian de etapa o propuesta. En su caso, debido a que el concepto artístico estaba ligado a un nombre, plantearon una solución original: morir como identidad y concepto. Declarar este proyecto-identidad-nombre finalizado era parte de un experimento para llegar a otra propuesta artística desconocida. Nortec Collective. Imagen de Internet. Cortesía de Heriberto Yépez. Finalmente, quiero abordar el caso de una antropóloga italiana llamada Fiamma Montezemolo. Ella se estableció en Tijuana en el 2002 para estudiar, precisamente, el arte fronterizo como parte de su proyecto como investigadora del Departamento de Estudios Culturales del Colegio de la Frontera Norte (Colef). Su proyecto de investigación consistía en hacer etnografía y análisis antropológico del movimiento de artistas fronterizos. Pero seis años después Montezemolo anunció, como consecuencia de su proceso de investigación y de interacción con la comunidad artística de Tijuana, su propia transformación en productora artística, abandonando su rol como científica social observadora para participar como creadora fronteriza. Fiamma Montezemolo, Echo, 2014, video. Cortesía de la artist. La obra de Montezemolo ha ido creciendo aceleradamente y se centra en el video y la instalación. Algunas de sus obras están temáticamente ligadas a la frontera y los laboratorios. Por ejemplo, Traces (2012) es un video que incluye una especie de poema en prosa donde Montezemolo habla con el muro divisorio entre Tijuana y San Diego buscando convertirlo en un polvo-elixir para renovar su propia vida; y en otro video titulado Eco (2014), Montezemolo examina qué ocurrió con ocho proyectos de arte instalación realizados durante los festivales de InSite (1994-2005) una vez que los festivales terminaban y los organizadores y el artista dejaban de darle seguimiento directo a sus piezas para sitio específico en Tijuana. La obra de Montezemolo forma parte del segundo momento de las estéticas fronterizas que surgieron a partir de Tijuana. Su obra es la más interesante de este segunda fase. Ciertamente el arte fronterizo manifestó y exploró lúdicamente los cambios en las identidades culturales durante las primeras etapas de la globalización. Estos artistas exploraron las mezclas de signos, idiomas, códigos, imaginarios y contextos ocurridas entre el Norte y Sur global, especialmente en el choque cultural entre México y Estados Unidos en el periodo del Tratado de Libre Comercio de América del Norte. Una parte importante del material con el que trabajaron sus obras fueron los repertorios resultados de la relación, flujos, intercambios, choques, asimetrías entre sociedades del norte y sur de la frontera. Los primeros comentaristas (como García Canclini) y, sobre todo, los propios artistas identificaron con claridad el trabajo con estos materiales como una de las intenciones de su poética fronteriza, así como a la reflexión creativa sobre la identidad (nacional y post-nacional) como una de sus principales temáticas. Si la primera etapa del arte fronterizo ha sido definido como una exploración material de los repertorios transfronterizos y un abordaje temático de la identidad cultural, el laboratorio de estos artistas, sin embargo, no se redujo a estos elementos. 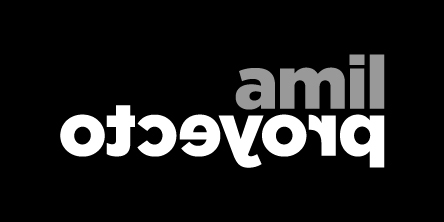 Su experimentación con la identidad incluye el “alterarse”, el “volverse otros” a través de nuevas prácticas, disciplinas, condiciones o fases; inclusive cuestionar o abandonar una identidad profesional y desarrollar otra. Rafa Saavedra hasta el final de su obra amplió su gama multidisciplinaria, rechazando la mera identidad de un escritor literario; miembros protagónicos de Nortec declararon el fin de su proyecto y una mutación de su identidad, materiales, nombre y concepto en general; partiendo de un proyecto institucional de etnografía, Fiamma Montezemolo terminó convirtiéndose en una nueva artista fronteriza-transnacional (ahora residente del área de la Bahía de San Francisco) construyendo un explosivo puente conceptual-profesional entre ser académica y ser artista, entre haberse convertido en el tipo de artista que originalmente sólo buscaba analizar. Estas mutaciones, más que tratarse de una nueva tendencia colectiva entre estas comunidades fueron un componente presente desde su inicio; y se ha convertido en un elemento estético cada vez más preponderante en etapas recientes. Bien podría ser que la creación de nuevas subjetividades sea el nuevo centro de las artes fronterizas. Esta persistente mutación de la identidad productiva se une actualmente a una sensación de que el periodo inicial del boom del arte fronterizo terminó. La estética basada en la mezcla y la hibridación no se sostiene ya como definición suficiente. La crítica los identificó con esta estética pero los artistas fronterizos, desde el inicio, insistieron en que sus búsquedas no podían reducirse al hibridismo. Ante el agotamiento de este componente de segundo orden, sus búsquedas, obviamente, han continuado; otros elementos presentes desde el comienzo y nuevos elementos que se han venido sumando dentro de sus exploraciones dirigen sus propuestas. Esta sensación colectiva de agotamiento de la estética hibridista, además, abre un nuevo juego de posibilidades ya no derivadas de los primeros materiales, la mezcla hibridizadora o el objeto artístico en general sino centradas en el sujeto y sus mutaciones de identidad; específicamente, en los cambios identitario-profesionales, identitario-disciplinarios, identitario-conceptuales del sujeto artístico neofronterizo. Los primeros críticos del arte fronterizo lo identificaron como centrado en la indagación de la identidad cultural. Pero en su obra y trayectoria, en realidad, los artistas fronterizos exhiben que lo puesto en juego no es tanto la identidad “cultural” como su identidad laboral. Esta precisión, a su vez, nos permite otra: el arte fronterizo es menos un archivo de productos estéticos nacidos de mezclas que una comunidad de productores mutantes. El arte fronterizo ha insistido en desestabilizar la identidad laboral del artista; ha experimentado con su (re)plasticidad. La palabra clave del arte fronterizo es: trabajo. Los artistas fronterizos, debido a que han operado bajo un contexto fuertemente local, donde el mercado del arte, e incluso la historia oficial del arte (nacional o internacional) no fue determinante de la forma de su obra, lograron que otras fuerzas operaran en su configuración. Como ya ha sido señalado, la propia dinámica económica de Tijuana formó a sus artistas y, en particular, sus modos de trabajo, desde el ensamblaje de la maquila, el reciclaje omnipresente y la movilidad laboral hasta el empleo informal y binacional parecen haberse convertido en fuerzas más determinantes en la forma de su obra y subjetividad que galerías, tradiciones nacionales o historias del arte. Para comenzar, la mayoría de los artistas fronterizos de Tijuana ni siquiera emergió de carreras universitarias vinculadas al arte. Desde su inicio, convertirse en artistas en Tijuana significó transformar radicalmente su identidad profesional-laboral. A más de dos décadas del inicio del arte fronterizo de Tijuana, podemos definirlo como un laboratorio de experimentación por parte de una comunidad que decidió configurar un perfil propio de sujetos-artísticos y que como comunidad siguió suscitando nuevas mutaciones en la subjetividad. Al observarlo retrospectivamente, el arte fronterizo nos muestra que uno de sus componentes claves ha sido la experimentación hacia nuevos tipos de productores artísticos. A un cuarto de siglo de su emergencia, es claro también que este laboratorio de experimentación subjetivante continúa re-inventándose. (2) Bowden, Charles: Juárez, the Laboratory of Our Future, Aperture, Mexico, 1998.